Background: In selected neonates and infants, primary palliative stent implantation may be indicated for coarctation of the aorta. We describe our experience with this approach in five consecutive patients. Methods: Five neonates and infants (age range 6 to 68 days, gestation 33 to 38 weeks, weight range at procedure of between 1650 to 4000 g) underwent palliative stent implantation as primary therapy for coarctation of the aorta. Indications for primary stent implantation were varied. All procedures were performed by elective surgical cut down of the axillary artery. Standard coronary stents (diameter 4.5 to 5 mm, length 12 to 16 mm) were delivered via a 4F sheath. The axillary artery was repaired after removal of the sheath. Results: All procedures were acutely successful, and without procedural complications. All patients survived to hospital discharge. Four patients have subsequently undergone elective stent removal and surgical repair of the arch, at between 38 and 83 days following stent implantation. Complete stent removal was achieved in three patients. Over a follow-up ranging between 8 weeks and 36 months, none of the patients has had any further complications. Conclusions: This palliative approach is warranted in carefully selected patients. Long-term follow-up is required. While surgery remains the desired therapeutic option for neonatal coarctation, alternative therapeutic approaches may be indicated in specific circumstances. Such approaches may include primary balloon angioplasty or stent implantation as a bailout option. ,,,,,, All of these approaches have been tried, although there are limited data for primary stent implantation in this setting. ,,, We describe the indications for, and the results of palliative stent implantation in a consecutive series of neonates and young infants. Indications for primary stent implantation, as opposed to surgical repair, were varied. Patient 1 had an extensive CAVM with aneurysmal dilation of the vein of Galen. It was decided, in consultation with the neurosurgeons, that this would require immediate embolization therapy, and that multiple interventional sessions would be required to address the CAVM. In view of the potential risk of hemorrhage, it was decided to defer surgical treatment of coarctation of the aorta, and to go for primary stent therapy, to adequately palliate the coarctation, and to provide reliable and repeated arterial access to the CAVM over an interval of several weeks. Patient 2 had a borderline left ventricle,  and was initially considered for a Norwood operation and single ventricle palliation. On postnatal review, stent implantation to relieve the coarctation was considered as interim palliation, in order to assess ability of the left ventricle to maintain anterograde systemic perfusion (FS at initial assessment of 32%) once the arterial duct had been allowed to close [Figure 1]. Based on this assessment, a subsequent decision would be made to either relieve the coarctation surgically after a suitable interval, or to proceed to single ventricle repair. 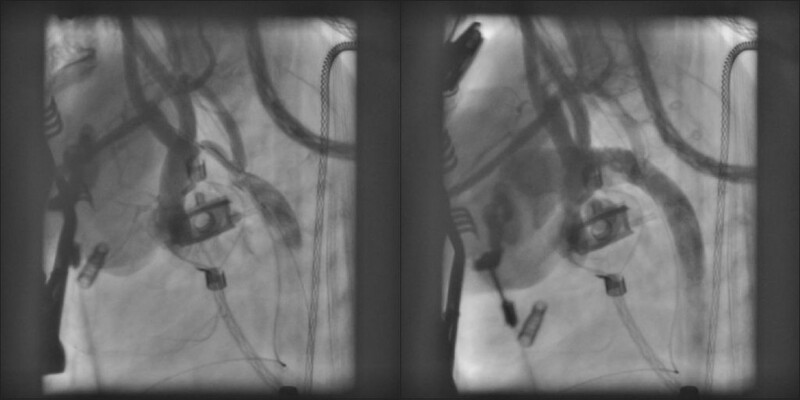 Primary balloon angioplasty was not considered for this patient, in order to avoid any early recoarctation, which might have interfered with assessment of the ability of the left ventricle to function independently. Patient 3 with critical aortic stenosis underwent two balloon dilation procedures of the aortic valve, the first procedure being undertaken at 2 days of age when the duct was patent. At initial aortography, no definitive coarctation was seen, although the transverse arch and isthmus were hypoplastic. During the second dilation procedure, performed at 68 days of age for recurrence of stenosis, coarctation was incidentally confirmed. The balloon dilation procedure was followed by a prolonged period of recurrent and sustained ventricular arrhythmia requiring several episodes of cardiopulmonary resuscitation and defibrillation (total resuscitation time of >60 min). Under these circumstances, once the patient was arrhythmia-free, and in view of the poor clinical condition of the patient (left ventricular FS <20% in the setting of high doses of inotrope therapy) a stent was implanted in the aorta at the same sitting to postpone any further catheter or surgical interventions until functional recovery of the ventricle. Patient 4 had trisomy 18, and was not expected to survive long term. Stent implantation was performed to enable discontinuation of prostaglandin E therapy and allow the child to be discharged home. Finally, patient 5 was a preterm neonate with tubular hypoplasia of the arch, in whom extended arch repair with hypothermia and circulatory arrest was considered riskier than initial stent palliation to allow for somatic growth and subsequent safe repair of the arch [Figure 2]. All stents were implanted using an axillary artery approach. The right axillary artery was exposed surgically, and punctured under direct vision. A 4F sheath was introduced into the artery. Intravenous heparin (50 IU/kg) was given as a bolus following arterial access. The coarctation site was crossed using an end hole catheter (multipurpose or right Judkins, Cordis, Johnson and Johnson, USA). The shortest possible stent length was chosen to adequately cover the coarctation site entirely. The target stent diameters were chosen to match as closely as possible the diameter of the descending thoracic aorta, but not to exceed 5 mm. Stents were inflated to their nominal diameter using an indeflator, at pressures recommended by the manufacturer. Repeat hand injections of contrast were performed through the side-arm of the sheath, to ensure appropriate stent position prior to expansion. Following full deployment of the stent, angiography via the end-hole catheter was performed to confirm appropriate stent position and relief of coarctation. Routine pressure gradients prestent implantation were not measured. Postimplantation gradients were measured by direct pullback. Thereafter, the catheter and sheath were removed, and the axillary artery surgically repaired. Intravenous heparin (5 IU/kg/h) was continued until the next morning; thereafter, oral aspirin (5 mg/kg/day) was given during the follow-up. Axillary artery access and cannulation were achieved without difficulty in all patients. Standard coronary artery stents (Liberte, Boston Scientific, Ireland; diameter of 4.5 or 5mm, lengths ranging from 12 to 16 mm) were deployed. Stents were advanced to the desired location directly over a 0.014" guide wire, without the use of a guiding catheter. Four infants had a single stent implanted; in one patient (patient 2), second stent was required to entirely cover the narrowed arch segment [Table 1]. The coarctation was entirely relieved in all patients, and prostaglandin E therapy could be immediately discontinued after the procedure. Postprocedure pullback gradients ranged from 0 to 5 mm Hg [median 1 mm Hg; [Table 1]]. The axillary artery was successfully repaired in all patients, all of whom had a palpable pulse at the end of the procedure. The procedure times, from initial skin incision to closure ranged between 42 and 118 min (median 48 min), and fluoroscopic times between 11 and 18 min (median 14 min). There were no procedure-related complications. Four of the five patients were extubated immediately following the procedure; patient 3 spent 24 h in the intensive care unit. Four of the five patients were successfully discharged from the hospital within 72 h of the procedure; patient 3 was discharged 1 week later. Patient 1 underwent six separate embolization procedures to successfully treat his CAVM. Thereafter, the stent was removed in its entirety and an end to end anastomosis of the aortic arch performed 77 days following stent implantation. Patient 2, with a borderline left ventricle underwent elective stent removal and extended arch repair at 44 days of age (38 days following stent implantation), and a biventricular circulation was successfully established. Patient 3 underwent elective stent removal and arch repair 76 days after stent implantation. In this patient, left ventricular function had normalized at outpatient follow-up 4 weeks after stent implantation (FS 38%). Patient 4 with trisomy 18, in whom no further procedures had been planned at our institution, presented to another institution for follow-up. At the parents' request, it was opted to surgically repair the coarctation of the aorta and close an associated VSD. This was successfully accomplished at 122 days of age (83 days after initial stent implantation). Patient 5 (follow-up interval of 9 weeks, current weight 2.7 kg) has had no further procedures to date. At last outpatient follow-up, the continuous wave peak Doppler velocity across the stented arch was <2.5 m/s. The follow-up interval ranges between 9 weeks and 36 months. None of the patients required any further interim procedures between stent implantation and elective surgical removal. Conceding that the follow-up interval postsurgery is short, none of the patients has had a recurrence of coarctation at follow-up. In patients 1, 3, and 4, the stent could be removed in its entirety, and an end to end anastomosis of the aorta performed. Removal of a single stent was, in the opinion of the surgeon, easy to perform and did not appear to complicate the subsequent repair of the aortic arch. In patient 2, in whom 2 stents were implanted, the stents were found to be extensively endothelialized, and could only partially be removed. An extended patch repair of the aorta was performed in this infant. Surgical repair is the therapeutic procedure of choice in neonates and infants with isolated coarctation of the aorta. Under special circumstances, as outlined in our case series, and also as has been reported by others, alternative approaches may need to be considered for initial palliation. Surgery in preterm and small infants, particularly if it requires deep hypothermia and circulatory arrest also has an increased morbidity, mortality, and higher re-coarctation rates when compared to mature term infants. , In selected patients, and under special circumstances, alternative therapeutic approaches may be warranted. Balloon angioplasty has an unpredictable result, with very high re-coarctation rates, due to recoil of ductal tissue in the coarctation segment. Redington et al. reported early recurrence of severe restenosis in 5 of 7 neonates, all of whom had been initially considered to have had an excellent result. In addition, the presence of severe isthmal hypoplasia was also a predictor of nonsuccess with balloon dilation. Kothari et al. also reported a 100% recurrence rate in infants under 3 months of age, following balloon dilation of isolated coarctation. Fiore et al. demonstrated that, when compared to surgery, balloon angioplasty in neonates was associated with a higher recurrence rate and an increased rate of aneurysm formation. The high recurrence rate, and more importantly the unpredictability regarding the interval between balloon angioplasty and clinically relevant recurrence may argue in favor of primary stent therapy in specific situations. In the series of Redington et al. re-coarctation was rapidly progressive, and recurred within two weeks after a normal Doppler examination in some patients. Stents have the potential advantage of preventing elastic recoil of the stented segment, and negating the influence of ductal constriction. Unlike balloon dilation, stenting also avoids overdilation of the stenotic segment, and could result in a decreased risk of aneurysm formation. Francis et al. reported on the use of stents in the setting of critically ill infants with left ventricular dysfunction. It would appear that these patients presented relatively late, after the arterial duct had closed, to explain their critical state and the presence of a large pressure gradient across the coarctation. 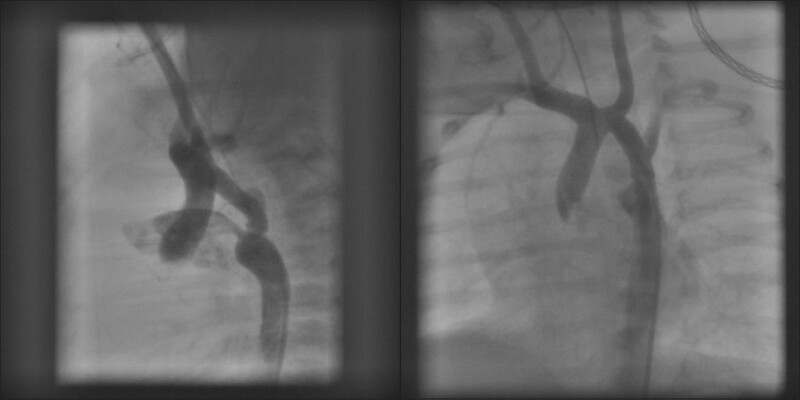 Stenting of the coarctation was acutely successful in all five patients in whom this was attempted. The diameter of the balloon and stent combination was chosen to match the diameter of the distal transverse arch, which might have accounted for the fact that one infant required stent redilation 3 weeks after the initial procedure. Unfortunately two of the five infants were lost to follow-up, making further detailed analysis of stent outcomes impossible. Al-Ata et al. described four infants with late presentation (after closure of the arterial duct, and one following failed balloon angioplasty). They used standard premounted noncoronary stents of larger diameter, as definitive palliation. As might be expected, this approach resulted in several reinterventions to re-expand the original stent. The largest series of primary stent implantation for coarctation in infancy was reported by Gorenflo et al. These were either very low birth weight, or more mature but critically ill neonates. In some of these patients percutaneous intervention was resorted to because this option was immediately available, as opposed to surgery. They demonstrated that even with the use of a 5 mm diameter coronary stent, elective surgical repair could be postponed in selected patients for durations of >70 months, allowing for increase in patient weight from <3 kg to >20 kg before definitive surgical repair. Experience with stent implantation in the aorta in neonates and young infants is limited. There have been isolated reports of stents having been left in situ for periods exceeding 3 months, without adversely affecting subsequent surgery. Radtke et al. described a series of three premature infants who underwent primary stent palliation by carotid artery cut down. Of the two survivors, one patient had the stent entirely removed 4 months later (after an intermediate stent redilation). In the other survivor, the stent could not be removed at surgery 3 months later, but had to be flattened out and left in place. In the two patients reported by Francis et al. who underwent subsequent surgical repair, there was no mention of any complications related to excision of the stented segment. In the series of Gorenflo et al., the stent could be easily picked up by the surgeon, if surgery was performed within a few days after implantation. If however, surgery was postponed, an endarterectomy needed to be performed in some patients. Although no stent struts could be seen on routine postoperative radiography, coronary artery stents are (as the authors also report) not very radio-opaque, and residual metal threads in the arch may have been missed. Given these conflicting data it is difficult to recommend an optimal time interval within which the stent needs to be removed. Decisions regarding surgery will also invariably be influenced by the clinical condition of the patient, somatic growth, and the requirement for other concomitant surgical procedures. Unlike most previously reported series, the majority of patients reported here were not critically ill, and surgery was theoretically available as the initial therapeutic option. Apart from patient 3, in whom the decision to implant a stent was taken in the catheterization laboratory (see below), in all other patients this decision was taken in collaboration with the cardiac surgeons. In addition, all the patients (except patient 3) had duct-dependent systemic perfusion, with preserved left ventricular function. The indications for choosing primary stent implantation have been outlined above. In patient 1, this was the potential risk of cerebral bleeding during cardiac surgery. In patient 2, the initial clinical and echocardiographic assessment was of a borderline left ventricle, as defined by previously accepted criteria. Temporary relief of arch obstruction and allowing the duct to close could clarify the future role and function of the left ventricle in this patient. In patient 3, the decision to implant a stent was made in extremis, to avoid further surgery in the foreseeable future. This is not to suggest that the observed coarctation played a role in this patient requiring prolonged cardiopulmonary resuscitation. In patient 4, stent implantation was discussed with the parents as definitive palliation, given the expected poor long-term outcome in patients with trisomy 18. Surprisingly, however, the parents opted for definitive surgical repair of the associated VSD, and this was performed together with stent removal. Finally, in patient 5, in whom clinical follow-up now extends to 8 weeks, there is no evidence for recoarctation, and the child has reached a weight of 2.7 kg, at which elective surgical repair should be safe and effective. In 2 of the 5 patients, the stent was deployed to partially cover the left-subclavian artery (patients 2 and 5). In both cases, though the vessel was "jailed," continued patency of the vessel was demonstrated on postprocedure angiography, and in patient 2, following definitive surgery, the left subclavian artery remained patent. Previous surgical experience with the Waldhausen subclavian flap repair has demonstrated that even complete loss of the left-subclavian artery is well tolerated in young patients. As with any relatively new approach, the number of patients in this series and the duration of follow-up are limited. Long-term follow-up and a larger series of patients will be required to address issues such as optimal timing of stent removal and corrective surgery, the risk of incomplete stent removal, and of late vascular complications at the stented site such as late aneurysm formation, and the frequency of recoarctation when compared to primary surgical repair. Primary stent implantation for palliation of coarctation of the aorta is technically feasible in preterm neonates and young infants, in whom surgery may be either risky, or relatively contraindicated for a variety of reasons. The acute and early follow-up results are sufficiently encouraging to consider further evaluation of this approach. 1. Redington AN, Booth P, Shore DF, Rigby ML. Primary balloon dilatation of coarctation of the aorta in neonates. Br Heart J 1990;64:277-81. 2. Kothari SS, Juneja R, Saxena A, Reddy SC, Sharma S. Balloon dilatation of simple aortic coarctation in neonates and infants. Indian Heart J 1998;50:187-92. 3. Fiore AC, Fischer LK, Schwartz T, Jureidini S, Balfour I, Carpenter D, et al. Comparison of angioplasty and surgery for neonatal aortic coarctation. Ann Thorac Surg 2005;80:1659-64; discussion 1664-5. 4. Radtke WA, Waller BR, Hebra A, Bradley SM. Palliative stent implantation for aortic coarctation in premature infants weighing <1500 g. Am J Cardiol 2002;90:1409-12. 5. Gorenflo M, Boshoff DE, Heying R, Eyskens B, Rega F, Meyns B, et al. Bailout stenting for critical coarctation in premature/critical/complex/early recoarcted neonates. Catheter Cardiovasc Interv 2010;75:553-61. 6. Francis E, Gayathri S, Vaidyanathan B, Kannan BR, Kumar RK. Emergency balloon dilation or stenting of critical coarctation of the aorta in newborns and infants: an effective interim palliation. Ann Pediatr Cardiol 2009;2:111-5. 7. Schranz D, Zartner P, Michel-Behnke I, Akintürk H. Bioabsorbable metal stents for percutaneous treatment of critical recoarctation of the aorta in a newborn. Catheter Cardiovasc Interv 2006;67:671-3. 8. Patterson MD, Du W, Skeens ME, Humes RA. Regression equations for calculation of Z scores of cardiac structures in a large cohort of healthy infants, children, and adolescents: An echocardiographic study. J Am Soc Echocardiogr 2008;21:922-34. 9. Corno AF. Borderline left ventricle. Eur J Cardiothorac Surg 2005;27:67-73. 10. Reddy VM, McIlhenney DB, Sagrado T, Parry AJ, Teitel DF, Hanley FL. Results of 102 cases of complete repair of congenital heart defects in patients weighing 700 to 2500 grams. J Thorac Cardiovasc Surg 1999;117:324-31. 11. Lee HY, Reddy SC, Rao PS. Evaluation of superficial femoral artery compromise and limb growth retardation after transfemoral balloon dilatations. Circulation 1997;95:974-80. 12. Al-Ata J, Arfi AM, Hussain A, Kouatly A, Galal MO. Stent angioplasty: An effective alternative in selected infants with critical native aortic coarctation. Pediatr Cardiol 2007;28:183-92. Haponiuk, I., Chojnicki, M., Steffens, M., (...), Zielinski, J., Gierat-Haponiuk, K.